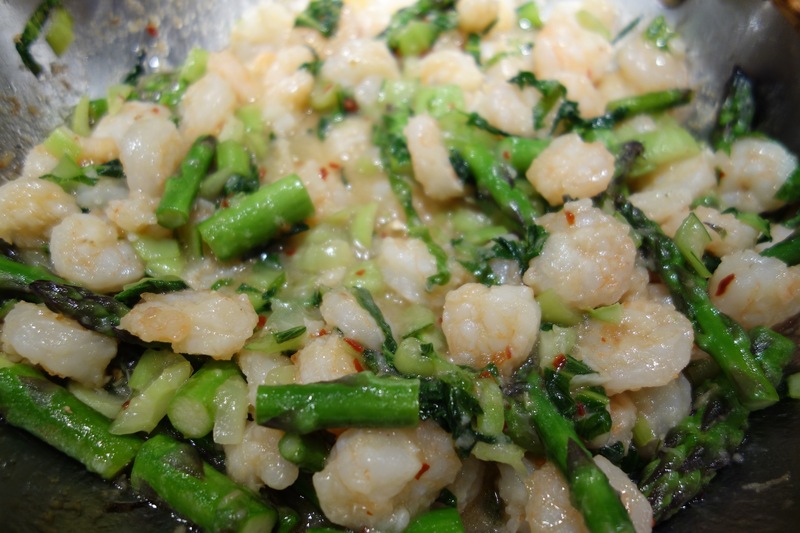 A yummy Chinese inspired recipe with delicious asparagus! Transfer the vinegar, sugar, garlic, pepper flakes, cooking wine and fish sauce to a small saucepan. Bring to a boil and simmer on a lower heat for about 7 to 8 minutes until the mixture is reduced by half. Check for seasonings and keep aside. Sprinkle the cornstarch and salt all over the shrimp. Mix and heat a wok like pan with the oil. Brown the shrimp on both sides in 2 to 3 batches- briefly. Take the shrimp out and set aside. Reheat the pan and add the garlic and ginger. Saute on medium heat and add the vegetables. Saute for 3 to 4 minutes. Add the shrimp and the chili sauce. Bring to a boil and simmer till the shrimp is cooked through. 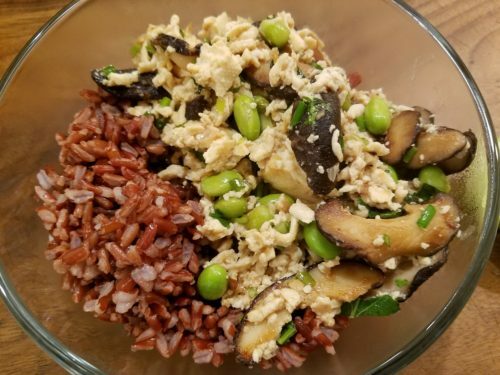 Serve with brown rice. Process the green onions, ginger and garlic in a food processor. Keep aside. Transfer the turkey meat onto a medium-mixing bowl. Pour the breadcrumbs into a small bowl and pour the sesame oil, oyster, Worcestershire sauce, tamari and the beaten egg on top. Let the breadcrumbs soak for 15 minutes and add to the turkey including the salt. Add the green onion mixture and mix well. Keep aside. Simmer the sauce in a medium saucepan. Form the meatballs and drop carefully. Cook the meatballs on a medium heat till all of them are formed. Cover with lid for ten minutes. Take the lid off and taste for seasonings. Serve hot with spaghetti. I love a one pot meal! 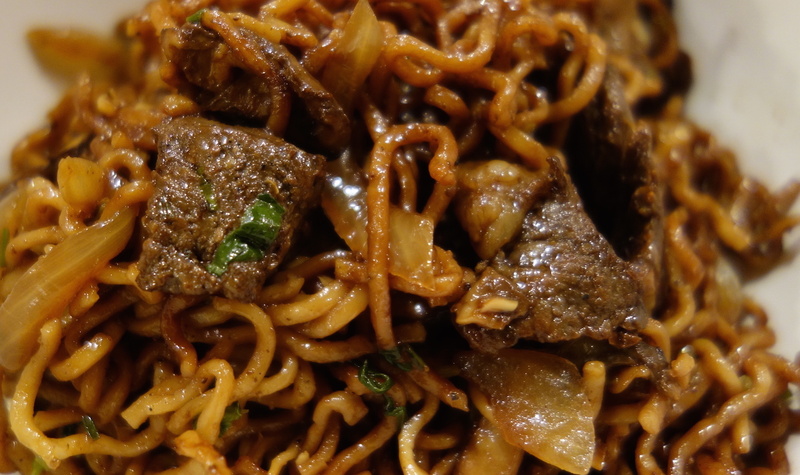 This is a yummy dish filled with noodles, steak and mushrooms. It is flavored with one of my favorite Chinese spices- Szechuan peppercorns!! Roast the peppercorns and cumin seeds in a pan for 2 to 3 minutes. Let them cool and grind till a powder is formed. Marinate the steak slices with the spice mixture and salt for 2 to 3 hours. Heat a wok like saucepan with the oil. Brown the steak on high heat for 2 to 3 minutes. Take out of the pan and add the mushrooms and sauté on high heat for 4 to 5 minutes. Add the onion and garlic. Saute for a minute and add the cooked noodles, steak slices and the sauces. Mix well and check for seasonings. Garnish with cilantro. I can eat noodles everyday, 3 times a day. I am always looking for different recipes… I really like this one. Very different flavored with cumin, coriander and ginger! 12 ounces flat wide noodles (wide pasta noodles can be substituted), cooked according to package instructions. Drain and drizzle with some oil and keep aside. 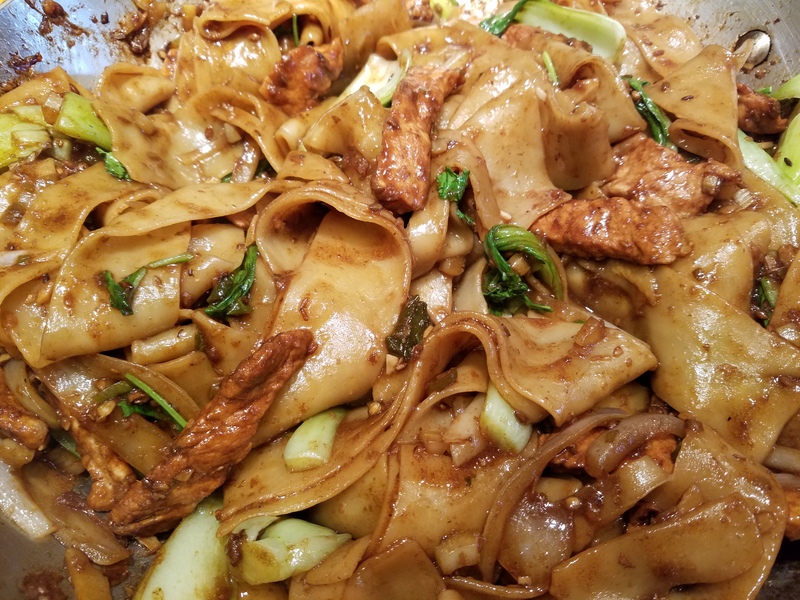 Combine the sliced pork with 1 tablespoon peanut oil, 1 tablespoon Shaoxing rice wine and 1 teaspoon cornstarch. Mix well and let it sit for at least an hour or up to 3 hours in the fridge. In a small pan, roast the cumin and coriander seeds until fragrant, about 5 minutes. Coarsely grind the spices in a mortar and pestle and set aside. 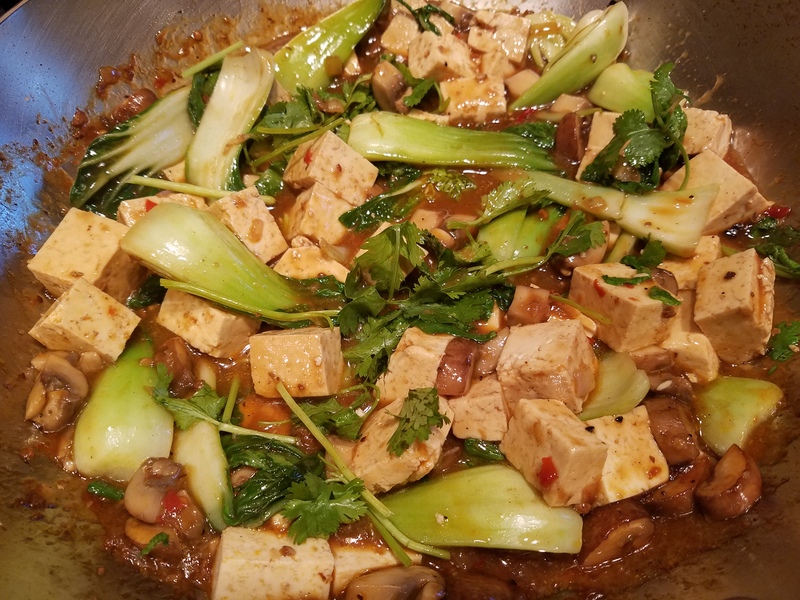 Heat 3 tablespoons peanut oil and add the ginger and scallion whites and cook on medium heat for a minute. Add the garlic and jalapeno pepper and cook for another 30 seconds. Turn the heat up and add the pork. Stir fry till browned and add onion and celery. Stir fry for another 2 minutes and add 2 tablespoons Shaoxing rice wine, the spice mixture, chili oil, sugar, rice vinegar, tamari. Add chicken broth to deglaze to pick up all the brown goodies from the bottom of the pan. Add the bok choy, stir fry for 2 minutes and add the noodles. Mix well, check for seasonings and add salt and garnish with cilantro. Serve immediately. Drain the tofu and pat dry making sure not to break the pieces. Mix the corn starch in water in a small bowl, mix and keep aside. Heat a wok like pan with peanut oil. Add the onion, ginger and garlic. Stir fry over high heat for 2 to 3 minutes. Add the mushrooms and sauté on high heat for 3 to 4 minutes. Move the veggie mixture to the side of the pan and add the chili bean sauce and Sichuan peppercorn powder. Saute for 30 seconds. 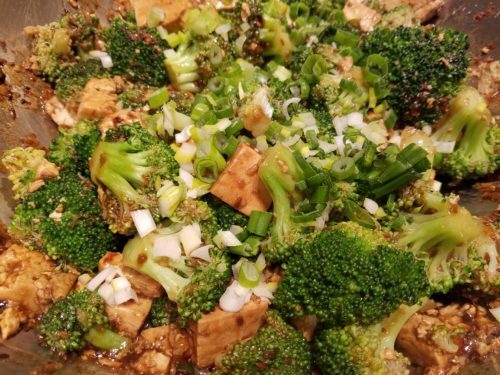 Mix in with the veggies and add the tamari, tofu, bok choy, broth and corn starch. Mix well and bring to a boil. Simmer for 2 to 3 minutes, add salt if needed. Garnish with cilantro.